By Gemma Ralton – Environmental Science Student and Blogger Palm oil is that hidden ingredient in almost everything we buy; food, make-up, cleaning products and toothpaste. Shockingly, many of us are unaware that it is also used as a cheap animal feed for cattle, pigs, poultry, goats and fish, as well as being huge in the biodiesel industry. With its ubiquitous hidden sources and over 170 different names it is no wonder many of us fail to avoid it, even if we try. Regardless of the name, palm oil is a type of vegetable oil, derived from the palm oil fruit and this palm oil industry is linked to major issues such as deforestation, habitat degradation, climate change, animal cruelty and indigenous rights abuses in the production countries. Every hour an area the size of 300 football pitches of rainforest is cleared to create space to grow the oil palms according to the WWF. 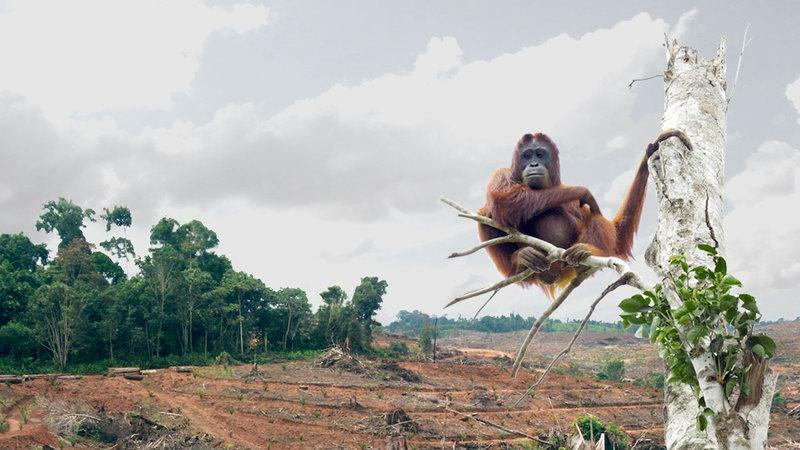 We are already in the Sixth Age of Mass Extinction and this industry is adding to the problem, threatening the orangutan and Sumatran tigers amongst other species. Our rainforests are precious refuges of life with huge biological complexity and the oil palm plantations are bare and lacking in terms of biodiversity. Unfortunately, avoiding palm oil is a difficult task but here are some simple tips to help combat this rapidly growing industry. 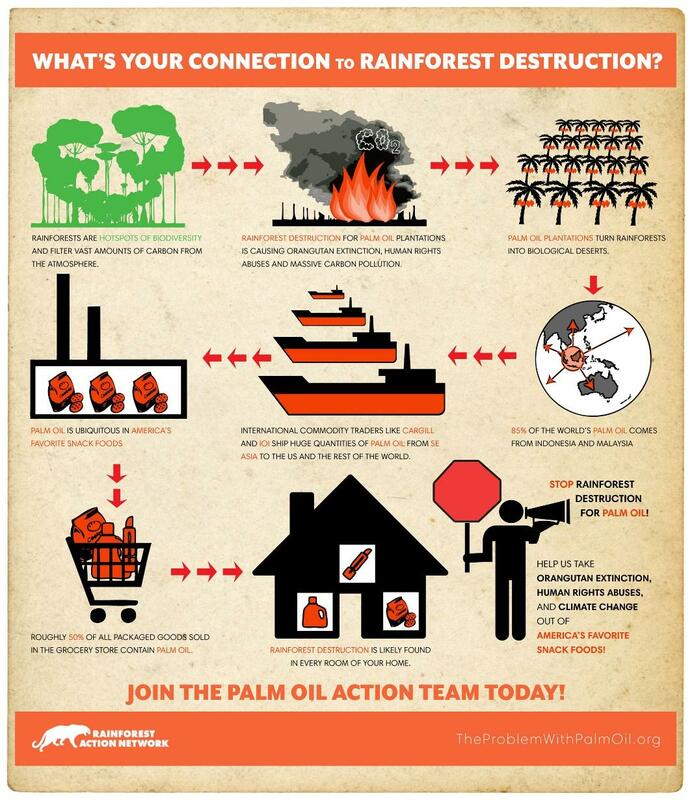 Large multinational corporations are the major users when it comes to palm oil. Companies such as McDonalds, Nestle and recently PepsiCo are some of the worst offenders, exploiting the versatility, easy money and cheap production costs to make big bucks in the consumer world. The WWF’s Palm Oil Buyers Scorecard highlights most of the companies to be concerned about but ideally, the best solution is to avoid all these big-name companies and corporate giants all together. A simple alternative to getting swept up in the palm-oil ridden madness is to grow or make your own foods. This can range from growing your own fruit and veg to making your own bread, fishcakes and other household goods. Not only is it cheaper, rewarding and more enjoyable but it also crucially ensures that you know which ingredients went into your meals, avoiding palm oil entirely. Another way to avoid big chain supermarkets entirely is to source local foods. For instance instead of buying commercially made meat and fish products like fishcakes, sourcing the food from local grocers, butchers and fishmongers and making products yourself is a much more sustainable alternative. It also puts the money you spend into your local economy rather than dissipating it into large brands. Instead of using palm oil, you can look for alternatives such as coconut oil, sunflower oil and rapeseed oil. It’s easy to make the switch and simple to search for products that contain these alternatives rather than palm oil too. For instance, Dr Bronners do a great coconut oil alongside tonnes of other fair-trade and organic products which are all super environmentally friendly. Another brand worth switching for is Meridian who proudly advertises their products are palm oil free! Not only do they sell perfect oil alternatives such as olive oil and grapeseed oil, but they also have loads of other eco-friendly food products too. If you’re not sure whether a brand is sustainable or if it even contains palm oil disguised amongst its many names, then check! It only takes a second but simply looking it up online can ensure you choose the most environmentally friendly products which creates less demand for more unsustainable brands and hence, less deforestation and its associated impacts from the increasing palm oil industry. Also look out for RSPO (Roundtable on Sustainable Palm Oil) marked on the products. This means they have been sustainably sourced as RSPO requires protection of the environment and wildlife while supporting poverty reduction from sustainable palm oil growers. Act for Wildlife have made a handy list of all the common RSPO certified brands which you can download from their website too. Incorporating these simple tips into your everyday life can drastically help pull the plug on the demand for palm oil but if you want to go that extra mile, why not sign up and take a stand against the brands themselves? Sign petitions such as the Rainforest Action Network’s Last Stand of the Orangutans or donate to charities such as theirs or WWF to help give a gentle push to persuade companies against using unsustainable palm oil. The Orangutan Foundation is another great charity, working to conserve the threatened orangutans and its globally important habitats. Donating or even volunteering with the company could massively help save these threatened creatures and you could be in for a once in a lifetime experience, seeing the orangutans in their natural habitat.